With award-winning wines on your doorstep, there’s no real need to go to the Continent to enjoy a vineyard tour. British wines have come into their own in recent years and as for vineyard experiences there’s plenty of brilliant experiences to be had, from hot air ballooning to fine dining, so we’ve picked out five of the best vineyard tours in the UK. Cornwall’s largest and most celebrated vineyard is famed for producing some of the best wines in the UK. Camel Valley’s awards speak for themselves: The 2008 White Pinot Noir Brut and 2009 Pinot Noir Rose Brut are both world-renowned wines and you can try them on the vineyard’s tour and tasting events. The wines are described as “perfectly balanced, quite fat but not full flavoured” by their maker, Sam Lindo, a former RAF pilot who founded the vineyards in 1989. The vineyards comprise some 82 acres of south-facing slopes bordering the Camel Trail, which follows the river from Bodmin Moor to Padstow If you want to spend more time in this picturesque location, there are two lovely stone-built holiday cottages available, which also come with a seasonal salmon fishing license for guests to use. You will find Chapel Down Wines set within 22 acres of vineyards in the heart of beautiful Kent countryside. Another award-winning gem, it boasts a host of accolades including Gold for their Rosé Brut at the 2011 International Wine Challenge. Meanwhile, the vineyard itself has been collecting awards too, including Best Leisure and Tourism Business 2010 at the annual Kent Excellence in Business Awards and Kent’s Best Vineyard in the Taste of Kent awards. But this will come as no surprise when you take in Chapel Down’s distinctive wow-factor. You are welcome to explore the grounds all year round, and enjoy the complimentary vineyard walks. For a particularly luxurious experience to remember, you might like to charter a hot air balloon over the vineyards or indulge in the fine dining Swan Restaurant which was acknowledged in the 2016 Michelin Guide. Visitors can also book a private VIP tour including tank tasting, wine matching tutorials, and sabrage demonstrations. The oldest established vineyard in Wales, the family-run Glyndwr Vineyard was planted in 1982 by Richard and Susan Norris and sits just outside Cowbridge amid lovely National Garden Scheme gardens. Ideal for both wine enthusiasts and gardeners, you are welcome to wander through the apple orchards taking in the ponds and the gardens where ducks, chickens, pheasants and llamas roam free. The vineyard is environmentally conscious with its hedges left to grow wild to encourage wildlife to live in harmony with the vines which are treated only with organic materials. Glyndwr has established a fine collection of Welsh wines which include a number of fruity whites, a vintage sparkling wine and an oak-aged red. Take a tour to walk around the vineyard, followed by tasting along with wonderful Welsh cheeses and home-cooked meals on site. There is also a typical countryside B&B cottage in the centre of the wildflower garden you might like to stay in to prolong your Glyndwr Vineyard experience. Situated near Dorking, Denbies is the UK’s biggest vineyard with over 250 acres of planted land. The chalky soil has been considered to be perfect for growing grapes since Roman times. The vineyard was planted in 1986 and now produces some of the finest table and sparkling wines in Europe, being certified each year in the International Wine Challenge and having received multiple international gold awards for its sparkling wines as well as for an English rose and the Denies Noble Harvest Dessert wine. Take a tour and you will be treated to a surround-vision cinema experience, along with a tour of the winery and tasting session. You can take a train ride that takes you around the estate. There are also two fine dining restaurants including The Gallery, which offers some of the best countryside views in the region. Founded by two farmers on half an acre of land in 1976, The Forest of Dean’s Three Choirs Vineyard has grown to 70 acres to become the ultimate viticulture experience including wine tastings, a visitor centre, a shop, tours, a B&B and restaurant. If you are looking for plenty to do for all the family, this is an ideal day out. 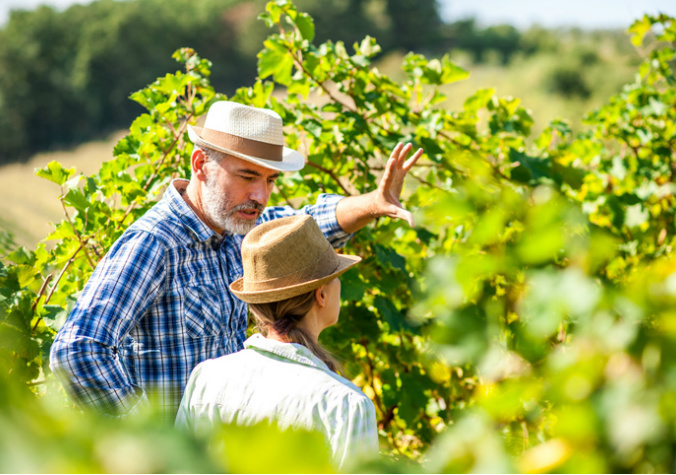 The vineyard tours are combined with a nature trail, complete with ladybird and hedgehog nesting boxes, fish-filled ponds, owls, badgers, rabbits and more. Dine at the Vineyard Restaurant or The Vine Room, if you would prefer to get involved, take a cookery course or ‘adopt a vine’. Looking to stay for a few days? Book one of the magnificent rooms with vineyard views or stay at one of the lovely Scandinavian lodges with their verandas and floor to ceiling windows.